For most older people, good health and an active lifestyle is an achievable goal with proper nutrition, medical check-ups, treatment of common risk factors, and attention to personal safety. The risk of heart attacks and strokes is reduced with treatment of hypertension and high cholesterol, smoking cessation, and good control of diabetes. Periodic check-ups, mammograms and PAP smears for women help to identify early but treatable diseases; and immunizations (influenza, bacterial pneumonia, for example) help prevent infections. Maintain a comfortable and safe weight. Eat a diet balanced in protein, fat, and carbohydrates. In particular, older adults should maintain an adequate protein intake of approximately 1-1.2 gm/kg of protein. For example, a 150 pound (70 kg) man should have approximately 70-100 gm of protein daily. Persons who are very physically active or have an infection or heightened metabolic need may require more protein. A chart of protein in different foods is shown below. Persons with chronic kidney disease should check with their physician about protein in their diet—sometimes a lower limit is suggested. In general, we recommend obtaining protein needs from food, not from powdered supplements. Adding non-fat dried milk to drinks and foods (such as coffee, oatmeal, potatoes), however, can increase the protein content safely, since 1 oz (2 tablespoons) contains 3 gm of protein. Use a multivitamin and mineral supplement if their diet is not balanced, they have been ill, or are losing weight. Vitamins do NOT contain protein. Consume at approximately 1000 mg of elemental calcium daily and 1,000 units of Vitamin D to help prevent osteoporosis and decrease the risk of falls and hip fractures. Persons with kidney stones or hyperparathyroidism should not utilize calcium supplements. Although there are health claims for supplemental antioxidants, such as vitamins C and E and beta carotene, the best way to get these substances is by eating a diet that includes fruits and vegetables. 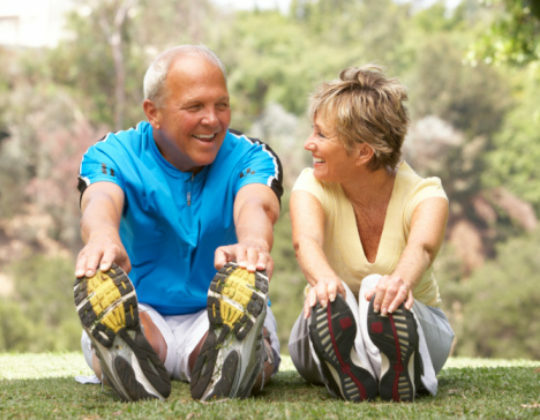 Regular physical exercise helps maintain good health and physical independence in old age. Healthful physical activities include aerobic (endurance) exercises such as walking, swimming, dancing ("low impact") and resistive (strengthening) exercises (after medical clearance) such as weight machines or elastic bands. Tai chi and senior yoga can help with balance, strength, and flexibility. Consider a personal trainer for proper technique in weights and stretching if you have not done this recently. Choose activities that you like. Make physical activity a part of each day. Don't overdo exercise—"start slow, go slow." Exercise with a friend or group. Modify the home to make it safer. Stay in contact with family and friends: stay active! Plan for future financial needs and living situation. Maintain a positive attitude: passions and interests. Below is a guide to choosing foods during the day that have adequate protein. You may wish to meet with a dietician to further guide your food choices.